Since the release of the Dietary Guidelines Advisory Committee (DGAC) report to the HHS/USDA, I cannot help but feel as if a change is coming (Guess I’m a little optimistic). The food pyramid, my friends, has fallen. This design is very simplistic but takes this infamous symbol of “health” ~*cough* “disease” *cough* ~ and turns it on its side letting others know that times are a changing. I think the shirt is a great conversation starter and plan on wearing it to the grocery store and other food-filled places. Go check out the new design at the DietaryDogma Store. There are 17 different premium styles spanning Men, Women and Children. Several of the designs are available in different colors and also in material such as Organic Cotton. If there is a particular style or type of apparel/merchandise you would like to see, please let us know in the comments section or via the Contact Us Form. 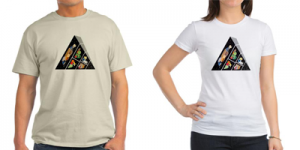 There are several other designs accessible from the main Store page; most of the designs are themed for alternative diet and health.